Fleet decision-makers will get an unrivalled opportunity to test Volvo’s new XC40 compact crossover at next month’s Fleet Show at Silverstone, as well as a first chance to view the all-new V60. The Volvo XC40 will be available to test drive at the 2018 Fleet Show. The winner of the WhatCar? 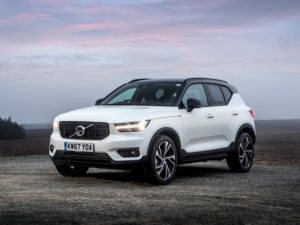 Car of the Year 2018 title, the XC40 – Volvo’s first model in the compact crossover sector – is the first to be based on Volvo’s latest Compact Modular Architecture (CMA), which will also be used for the next V40. Providing a direct rival to crossovers such as the Audi Q3, BMW X1 and Mercedes-Benz GLA, the model gets a range of diesel and electric engines, which will be joined by a plug-in hybrid version this year and a fully-electric version in the future. Attendees will also be able to test the XC60 and XC90 plug-in hybrids and the S90 executive saloon while also benefiting from a sneak preview of the V60 estate ahead of its launch this autumn. At the 2018 Fleet Show – which takes place on 9 May – fleet decision-makers will be able to test the XC40 on a choice of three separate circuits of the world-famous Silverstone Grand Prix track – the National, International and Stowe circuits – plus a local road route.